1-7 Used for the fire circle setup (all seven OCB-codes required). No visible change in appearance. Horizontal flames (like those that come from statues mouths) can be timed for when they are on and off. Here are a few OCB codes for the flame emitter: Please note these are approximations only. you a horizontal flame that is on for 6 seconds and off for over a minute! -8 to -2 Used to flip flipmaps with the positive version of the OCB number, no matter if the relevant flame_emitter2 is near the flipmap in question. No flame will appear if a flipmap with the correct number exists (otherwise a small flame appears). Used for special setups (example: the scales setup) that demand partial triggers (using codebits). -1 Will flip flipmap like the above settings, but is also used for the lightning conductor setup. 2 small flame moving slowly along the floor in the direction of the cone and will go up and down slopes. On contact with water, the flame will produce a bright flash and extinguish. If you place the nullmesh above water with a one shot trigger it will produce a bright flash but no flame. The flame emitter 2 object can also be used to trigger flipmaps. The nullmesh must be placed in the same room as the flipmap and must contain the same number (but negative -) as the flipmap in its OCB. When the flame emitter nullmesh is triggered it will activate the flipmap. This is used in combination flipmaps that employ codebits. 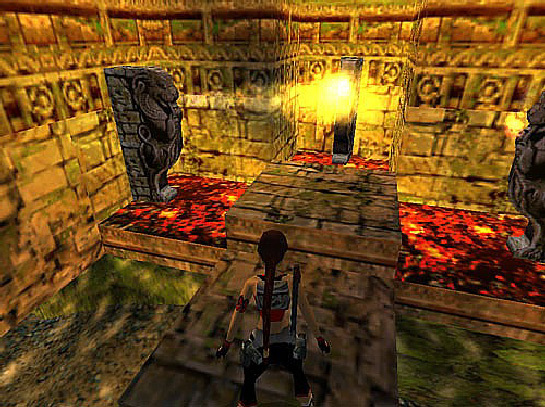 The Scales puzzle in the Temple of Horus and the Lightning Conductor puzzle in Street Bazaar are examples of where this setup is necessary. You can make some nice puzzles using these!